is a part of the Japanese rural landscape that has been developed from centuries of agricultural use. The concept of satoyama has several definitions. The first definition is the management of forests through local agricultural communities. During the Edo era, young and fallen leaves were gathered from community forests to use as fertilizer in wet rice paddy fields. Villagers also used wood for construction, cooking and heating. More recently, satoyama has been defined not only as mixed community forests, but also as entire landscapes that are used for agriculture. According to this definition, satoyama contains a mosaic of mixed forests, rice paddy fields, dry rice fields, grasslands, streams, ponds, and reservoirs for irrigation. Farmers use the grasslands to feed horses and cattle. Streams, ponds, and reservoirs play an important role in adjusting water levels of paddy fields and farming fish as a food source. Various habitat types for wildlife have been provided by mixed satoyama landscape as a result of Japanese traditional agricultural system what also facilitates the movement of wildlife between a variety of habitats. The migration of wild animals can occur among the ponds, rice paddy fields, grasslands, forests, and also from one village to another. Because of these ecosystems, a rich biodiversity in the Japanese rural area has been maintained. Ponds, reservoirs, and streams in particular play a significant role in the survival of water dependent species such as dragonflies, and fireflies. In early stage of their life cycle, they spend most of their time in water. Through maintaining a mixture of successional stages by the agricultural activities and the management of satoyama, the preservation and promotion of biodiversity are facilitated. For instance, Japanese oaks and Japanese chestnut oaks are planted by farmers to maintain deciduous broad-leaf trees. Succession to dense and dark laurel forest is prevented by farmers that cut down these trees for fuelwood and charcoal every 15 to 20 years. Most plant and animal species are able to live in these deciduous forests because of traditional management practices. Therefore, much more wildlife can be supported by well managed forests than dark unmanaged laurel forests. Throughout the 80s and 90s, the satoyama conservation movement was implemented in Japan because people realized that satoyama were needed to maintain healthy ecosystems. The concept of satoyama has become widely known through a documentary film with David Attenborough. Whereas yamazato 山里 refers to the village in the mountains itself, the reverse, satoyama 里山, refers to the mountains around a village, especially the part that is used by all for common purposes and in, or rather was, an important part of the rural ecology. It was used commonly by all the farmers living nearby. "The Taste of my Native Place"
In the Kumano area of Wakayama, the god of the woods (mori no kami 森の神) is also the god of food "tabemono no kami 食べ物の神様". Most of the words mentioned below are kigo. Check the WKD for more details. Iomante Festival and many more. Matagi ryoori, matagi ryori マタギ料理, the cuisine of the hunters, mostly wild boar, wild hare (no-usagi) and deer. The bear hunters (matagi　マタギ) take a special kind of onigiri into the woods for hunting expeditions. Two rice bowld are filled to the flat with rice and then added together to form one big round ball. Inside just a little bit of dried fish is added. Nothing with vinegar is allowed to be added, since the taste and word SUPPAI (tasting like vinegar) may not be uttered during the hunt ... it could be pronouced like SHIPPAI (to have no sucess) and nobody wants this ! Meat from horses, usually called sakura, was also widely eaten. There were even special chopsticks to eat it, kajikibashi 鹿食箸. "The thing we should shun more than anything is the meat of wild beasts and birds." Often prepared with a dressing. The juice is drunk or fermented to wine. Many are kigo for autumn. ... kachiguri 勝栗（かちぐり） "winning chestnut"
chestnut to pass an examination. A pun with kachiguri 搗栗, dried chestnuts. 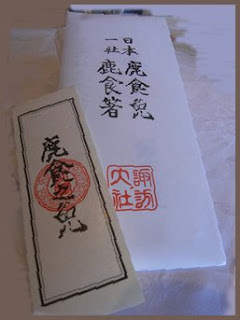 Some temples and shrines pack them in their talisman packages for examination students. Already eaten in the Jomon period. Sansai should be picked fresh from the forest and then eaten soon. But now many varieties are sold in supermarkets and some villages grow them in fields. Most of them are quite bitter and many are prepared as tempura. aomono-tori 青物取り taking green things, is still a common word for collecting sansai in spring. Good places to collect sansai are the deciduous forests of Akita, Niigata, Yamagata and Tooyama. Gemüsekombination mit Adlerfarn, Königsfarn, Bambussprossen und Kikurage-Pilzen. On of the earliest forest vegetables and quite bitter. The outer layer of the stem is peeled off and part of the root cut away. Can be used raw for tempura or in soups. Boiling it shortly and arrange it with dressing or simmer. Also fried with miso (miso itame). It takes a few days of repeated simmering to prepare it. It used to be eaten during the war time when no other food was available in the poor communities. The color resembles that of KYARA, a precious fragrant wood. found in the Kumano forests of Wakayama. It contains a lot of oxalic acid and "tasts as bitter as life". Placed in soup or as oyatsu snack. The young stems are edible as a spring vegetable, with a flavor similar to mild rhubarb. The roots of Japanese knotweed are used in traditional Chinese and Japanese herbal medicines as a natural laxative.
. itadori matsuri 虎杖祭（いたどりまつり "knotweed festival" . It has a rather pleasant taste and is a favorite sansai. Boil quickly before using it. As ohitashi or with vinegar or sesame dressing. Used raw for tempura.
. . . CLICK here for kogomi Photos ! Grows in many areas of the woods in Japan. Its buds are picked in spring. Eaten as tempura or with dressing. Boil in salt water before using a dressing. Sesame dressing and walnut dressing (kurumi ae). Roast quickly and dip in miso dressing. kusagi 臭木 （くさぎ） "bad smelling tree"
kusagina くさぎな、クサギナ leaves of kusagi.
. . . CLICK here for kusagina Photos ! edible plant in the Kumano area and many other regions. Helps against high blood pressure, nerve pain and headache.
. . . CLICK here for kusagi Photos ! Also simply called MIZU, water, because it stem contains so much liquid. Used for soup. Speciality of Tohoku.
. Japanese parsley or dropwort (seri せり), . Boil quickly before use. As ohitashi or with vinegar dressing. The rood part looks like a shallot and has a special taste. The long green stem and the white branches are eaten. Has a slightly bitter taste. Boil quickly in salt water. As ohitashi or with dressing. Synurus pungens, a kind of smelly mountain thistle. It grows well along the roadside. Our local farmers pick it up on the way home and eat it in the dinner soup or with a dressing. Soak for a long time in water before use. With sesame dressing. With scrambled eggs.
. Mafukuda ga hakama yosou ka tsukuzukushi . even without wind, it is swinging all by itself. Very crunchy to the taste (shakishaki, knusprig). It helps when you feel a cold coming in winter. Peel the outer layer of the stem, cut in oblong pieces, soak in vinegar-water and dry. Eat with vinegared dressings or vinegar miso. The very top of the plant can be used for tempura. The peel can also be cut finely, put in vinegar-water over night and then used for kinpira or tsukudani. picking bracken, warabi tori 蕨採り（わらびとり）. ..... warabigari 蕨狩 (わらびがり) "hunting for bracken"
It has a strong acrid alcaline taste and needs special treatment before eating (aku あく(灰汁 ) o toru). It is a well-liked side-dish, as it grows free in the mountain forests and is thus one of the joys of mountain life. Eaten as tempura or in noodle soups, as topping for soba noodles and other dishes. Warabi is also collected in autumn to eat its leaves.
. fern, shida しだ、歯朶 . Together with warebi one of the most loved ferns in spring. Its head when it comes out is curled "like the Japanese hiragana letter NO の” and covered in soft white hair. This resembles an old coin (zeni), hence the naming. When it unfurls, it can grow as much as 60 cm to 1 meter high. Has a strong acrid taste and needs soaking in water for a few hours before use. Used in fried dishes or nibitashi, simmered or with dressing. Also as tsukemono pickles. Jakko Jodo 寂光浄土 (jakkoo joodo, 常寂光土) "Pure Land of Tranquil Light" is the highest Buddhist Paradise of the four paradises of the Tendai sect. It is beyond the realm of extasy and the six realms of existence. A nunnery in Kyoto, Inuyama. Iwate, Yuda Town 湯田地区堆肥, launched in 2003 to sell local mountain vegetables and help the rural area to revitalize. With the combination of another municipality, the project died in 2005, due to lack of funds. There is a Native American custom among some tribes of carrying buckeyes for good luck, my wife carries hers just to remind her of her childhood home. you are a hard worker, dear Gabi! and your informations are so interesting! I learn a lot via your net! First published in 1926, this classic survey, which includes nearly 250 photographs, examines the traditional farming methods of the densely populated lands of China, Korea and Japan and shows how fertility can be maintained over many centuries through conserving and utilizing natural resources. from the lighthouse . . . In a home he was served bitter warabijiru 蕨汁 bracken fern soup, so he taught the farmer how to make this soup with a sweet taste 甘蕨.